In the previous post for our Micro Charts product (currently available for WPF, Silverlight, and WinRT XAML), we talked about the minimum and maximum functionality of the new MicroBoxPlot control. In today's post, we'll look at the many ways to customize the control's appearance. The orientation of the graph can be set to vertical to effectively rotate the graph ninety degrees counter-clockwise. 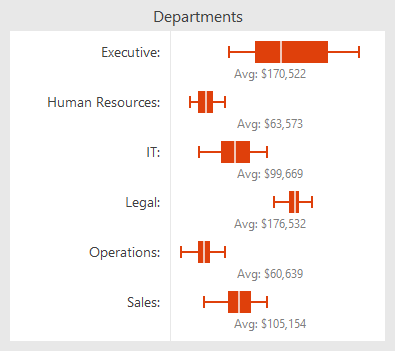 Several charts can be given a vertical orientation then placed side by side to create a report that flows horizontally. Each part of the MicroBoxPlot control has a style that can be set to customize the size and colors of the chart. The box is rendered as a rectangle and therefore a fill and stroke brush can be specified to alter the color. The median, mean, and whiskers are all rendered as paths, provide options for stroke color, stroke thickness, and other options, such as dashed lines. As mentioned in a previous post, the whisker extent is dependent upon the IQR multiplier. Whiskers can be removed entirely by setting the IQR multiplier to zero. The size of the perpendicular whisker end lines can be customized using the whisker ascent property, which commonly accepts percentage and pixel values. If the whisker ascent is set to zero then no end lines will be displayed. The examples above show a few of the many options for MicroBoxPlot appearance customization. Tool tips can also be used on MicroBoxPlots. They can be custom formatted and can display all the part values and the minimum and maximum properties. The maximum and minimum values will display the actual minimum and maximum of the data, meaning the minimum and maximum of the chart can be custom set and the tool tip will still accurately represent the data. The MicroBoxPlot control is currently available in the Micro Charts product, which ships in our WPF, Silverlight, and WinRT XAML control sets. This concludes our series on the MicroBoxPlot control. Watch for more micro chart-related posts soon. We're pleased to announce that the samples app for our WinRT XAML controls is now published and available on the Windows Store for free download. If you have Windows 8, download the demo app to try out our UI control offerings for Windows 8 app developers. 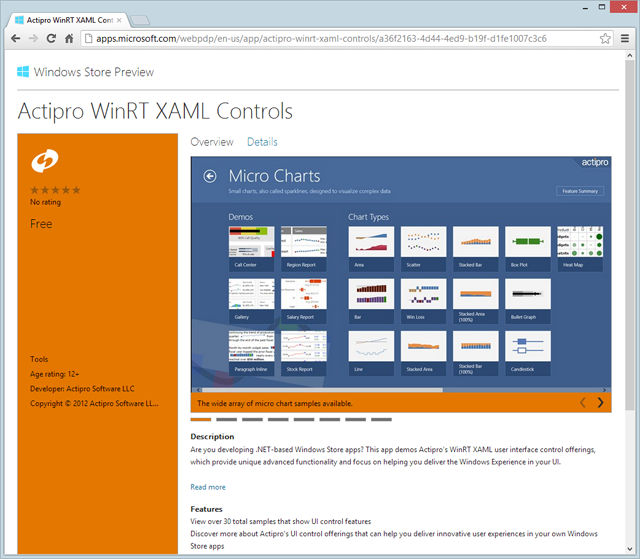 In the previous post for our Micro Charts product (currently available for WPF, Silverlight, and WinRT XAML), we looked at various features of the MicroBulletGraph control. In today's post, we'll introduce a different type of chart with the new MicroBoxPlot control. Box plots are excellent tools for creating charts that show statistical distribution in datasets. They are particularly useful for displaying distributions of a group in a compact way. This is good for creating charts that compare a group of data such as the performance of salespeople, heights of a group of people, temperatures along a latitude, and more. This example shows how box plots can illustrate the distributions of salaries paid to employees based on how long the employee has been with the company. Box plots are designed to display the statistical distribution of a dataset. They display a set of data through five major values: the lower whisker value, the lower quartile value, the median, the upper quartile, and the upper whisker value. The median is the value found directly in the center of the data when it is sorted, meaning half of the data lies above it, and half lies below it. The median is displayed as a perpendicular line to the chart. The lower quartile is the median of the lower half of data, resulting in a quarter of the data being less than it, and three-quarters being greater. The upper quartile is the median of the higher half of data, resulting in three-quarters of the data being less than it, and a quarter being greater. The upper and lower quartiles define the edges of a box drawn on the chart, resulting in the middle half of the data being contained within the box. The whiskers are displayed as "T" bars that extend from the edges of the box to their respective values and are designed to hold the majority of the remaining data, leaving only the outliers outside. In the example above all the parts of the control are displayed and labeled. The spacing between the different parts of the box plot help indicate the degree of spread in the data. The difference between the upper and lower quartiles is known as the Interquartile Range (IQR). The product of the IQR and the IQR multiplier (normally a value of 1.5) is then subtracted from the lower quartile value to get the lower whisker value and added to the upper quartile value to get the upper whisker value. The IQR multiplier can be set to any value greater than or equal to zero to customize the extent of the whiskers. In our next post of this series, we'll take a look at the minimum and maximum display values. This quarter featured several major releases, including 2012.2 versions of our WPF controls and Silverlight controls, along with our first set of UI controls for the WinRT/XAML (Windows 8 app) platform. The WPF and Silverlight controls received new SyntaxEditor features like a navigable symbol selector control (similar to a type/member list), code snippet selection sessions, structure matching (bracket highlighting), and support for the latest C#/VB specs and improved resolver functionality in the .NET Languages Add-on. Micro Charts on those platforms received new heat map, bullet graph, candlestick chart, and box plot controls. WPF also gained a new Metro Light theme that is inspired from the latest Visual Studio and Office version appearances. Our first offering of UI controls for .NET Windows 8 apps contains a full-featured version of our Micro Charts product. We've put together a great sample project to show the charts' use in building dashboards, reports, and grids. If you have Windows 8, download a free evaluation and check them out. We are currently working in several areas. First, we are developing another brand new product that will target WPF, Silverlight, and WinRT/XAML. Second, we are adding more SyntaxEditor features and enhancements to other existing products. Third, we are working on some more ports of our controls to WinRT/XAML.